“He was a visionary” in regards to the peace process and working for his people and community, said Doe Doh of the Karen Environmental and Social Action Network (KESAN). Doe Doh said he and Saw O Moo had grown close over the past five years and described his friend as “genuine” in his role as a member of Lu Thaw Paw Day, a community-based organization that works with KESAN. “He tried to protect the natural resources” and worked tirelessly to do so after the government and military signed a bilateral ceasefire deal and later, in 2015, the Nationwide Ceasefire Agreement with the Karen National Liberation Army (KNLA). Saw O Moo was shot and killed by soldiers of the Myanmar army, or Tatmadaw, while driving home on the evening of April 5 from a community meeting on how to support displaced villagers in Mutraw (also known as Papun) District. A KNLA fighter whom Saw O Moo was giving a lift to managed to escape but recalled hearing a hail of gunfire. More than six Tatmadaw battalions have been deployed to Lu Thaw Township since early March to seize an area controlled by the KNLA in order to expand a military road abandoned in 2012 and connect two mountain bases. Since then, fighting between the Tatmadaw and KNLA has been ongoing. As an indigenous wildlife researcher, Saw O Moo worked to preserve old-growth forest inside a 5,400-square km area in northern Karen State in hopes of turning it into a “peace park” in partnership with KESAN and the Forestry Department of the Karen National Union. The area along the Salween River Basin is home to several endangered and vulnerable animals including tigers, clouded leopards, sun bears and gibbons and many other species of flora and fauna. As an animist and ethnic Karen from the area, Saw O Moo was indispensable in helping to bridge the many communities living in the proposed park’s boundaries, and in sorting out disagreements over the direction of the park, explained Doe Doh. A month after Saw O Moo’s death, the Tatmadaw has yet to return his body, which it claims to have buried. 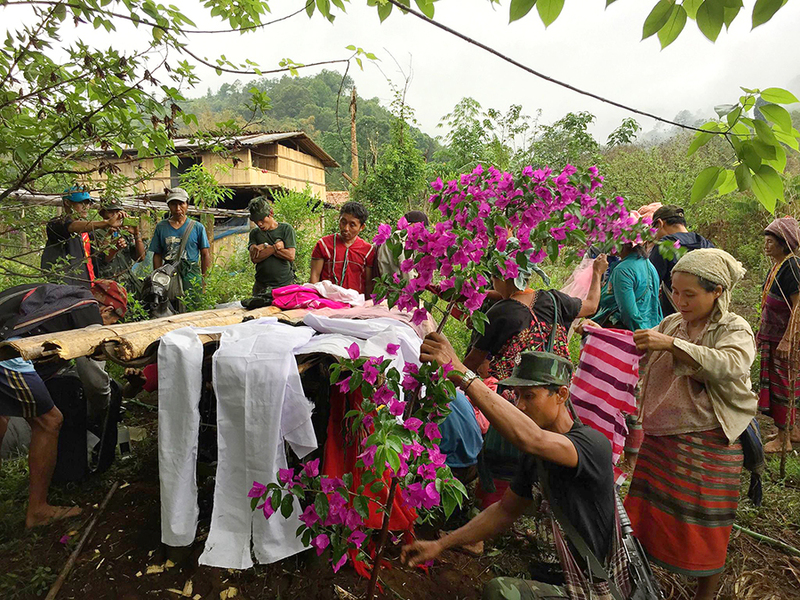 Even so, family and friends attempted to hold a three-day funeral in his home village of Ler Mu Plaw according to their animist traditions. But they fled in fear on the second day when a large group of Tatmadaw soldiers was spotted nearby. Saw O Moo’s wife, Naw Paw Tha, is angry the army is refusing to return her husband’s body. With her husband gone, Naw Paw Tha wonders how she and their seven children will survive. They are currently living in a camp for displaced families, after having to flee from the Tatmadaw’s offensives. Seated at the front of the memorial service in Mae Sot, their sons Saw Maw Chit Nue, 10, and Saw Lwe Soe, 9, cried at times over the loss of their father.